Where evil exists, trends will collide! Amazon Studios has reportedly gotten the ball rolling on bringing the live-action comedy The Tick back to audiences, thus combining the recent focus on resurrecting cult series with American’s undying love for all things superhero. And who can deny the snazzy of that? We’re still taking this news with a grain of salt, since it hasn’t officially been confirmed by Amazon yet, but People is saying that not only is the streaming hub reviving the series, but that the show’s star Patrick Warburton has already signed a contract with Amazon and Sony to don the bulky blue suit again. Considering just how perfect Warburton was for the job in the first place, this is the kind of news that’s almost too good to be spoon, er, true. And fans don’t have to worry about some outsider stepping in to take the series’ reins, as People’s sources also tell them that franchise creator Ben Edlund would be back to executive produce and write the scripts. 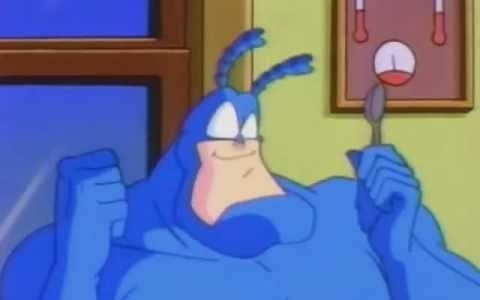 Edlund made a name for himself and The Tick when he first started independently publishing the comic series back in the late 1980s, then adapting it into the 1994 animated series. The Tick first found live-action fame when Fox aired its shortened nine-episode season in 2001. It’s probably no surprise to anyone that Fox would cancel a fan-favorite show before it found a larger audience, and Warburton has made his opinion clear over the years that Fox’s non-ownership of the show led to them giving it backseat attention and claiming it was too expensive to produce. The Tick, whose past is mostly a mystery, is one of the superheroes in charge of protecting The City, partnered with sidekick Arthur, a flying man in a moth suit. Their adventures also included the lackadaisical assistance from the Latino Dark Knight Batmanuel (Nestor Carbonell) and the Wonder Woman-ish Captain Liberty (Liz Vassey). The latter two were based on the comic characters Die Fledermaus and American Maid, respectively, but rights issues kept their names and images from being used. It’s unclear whether these issues would be solved if Amazon gets involved, or if they’d just keep the previously established characters. I’m sure the Tick wouldn’t remember either way. In the years after The Tick’s TV run, Edlund was a writer/producer on Firefly – a series that has seen its share of “Save This Show” campaigns over the years – as well as Angel, Supernatural and, most recently, Revolution. Should he indeed be bringing The Tick back to his fans, there’s a good chance he’ll have an even better approach to the storytelling and filmmaking. Has it been a while since you’ve spent some quality time with The Tick? Find all nine episodes currently streaming on Netflix here.